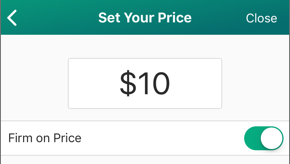 When you’re listing an item for sale, you’ll be asked to set a price. You have the option of setting a firm price or letting buyers make their own offers. When you set a firm price, buyers will only be able to make offers at the posted price. They may still message you to ask if you're willing to take a lower offer, however. Setting a firm price is a great option when you have a have a good idea of what the item should cost or need to get a specific amount for it. If you’re willing to be flexible on an item’s price, you can set an asking price. Buyers may make an offer at this or any other amount. You're free to accept, negotiate, or say no to any offer. Begin with a reasonable suggested price so buyers have a good idea of what to offer. This will help you sell the item faster and prevent low offers. For suggestions on fair pricing, try searching for similar items to see what other sellers are asking for. If you get an offer below your acceptable limit, respond politely and share your preferred price or give a counteroffer. Keep an open mind, especially if you aren't sure of an item's value. Respond courteously even if you get an unacceptably low offer. Buyers don't always know what an item's value is.